This program reminds you about future (and past) birthdays and (wedding) anniversaries. Information is taken directly from your Address Book (list of Contacts), this allows you to avoid duplicating the same information in several places. These Address Books are supported: Address Book of MS Outlook Express, Contacts of MS Outlook, and any other address book, that may be presented in XML format. To edit the list of contacts (i.e. friends) and their anniversaries (the "List of events"), you continue using your "Address Book Application" (Outlook Express, etc.). However you may change (and view) full information for any contact and interact with him (or her) directly from yvReminder. yvReminder doesn't substitute any of these programs - instead, it cooperates with them, making routine operations for you. yvReminder launches automatically each time system starts (its shortcut is placed in the "Startup" folder). It scans for the dates (satisfying the "AutoClose scan filter") and closes in a case nothing was found (due to the "AutoClose=1" command line parameter). To launch yvReminder without any conditions, click it's shortcut on your Desktop. Columns of the "List of events" and additional information for the selected contact (below the List of events) are customizable: you can choose from the long list of properties as much (or as few) propreties to be shown, as you wish. This list of properties includes almost every information, that is stored in Address book. You may even see such useful data, as "Last Modification Date" of contact's record, that is not shown in "Address book" application itself :-). Events in the table may be sorted by any column, in ascending or descending order. To change sorting order, click on title of an appropriate column. Change size of program window and widths of columns as you wish. Your settings will be stored. - with very easy procedure to add your language, if it's not in the list. If both Bithday and Anniversary dates are indicated for one contact, that contact will have two lines in the list (one for each event)! Download ZIP-archive of the program and unZIP it to any temporary directory. There is only one file to install inside the ZIP-archive: yvReminder_Setup.exe - run it. This setup program will offer you to uninstall previous version of yvReminder. In a case of problems, please see "Tips and Troubleshooting" section below. This native MS Outlook support was successfully tested with MS Outlook 2007 and 2003. To access MS Outlook contacts, you have to select in the menu "File"->"Select Address Book Type..."->"MS Outlook Contacts". yvReminder lets you select any contacts folder (not only Default contacts folder, as in case of "Method 2" described below). To edit contact's information, yvReminder opens the same Outlook "Contact" window, as in Outlook itself. This method successfully worked from the first versions of yvReminder for MS Outlook 98, 2000, 2002 and 2003. Unfortunately, this method doesn't work for MS Outlook 2007. That "Address Book of MS Outlook Express" is called Windows Address Book (WAB). In order to use yvReminder with MS Outlook, your computer has to be configured "To share Contacts between Outlook and Outlook Express". See this link for more details. If the address book is configured to share contact information with Outlook Contacts, you may use yvReminder and don't bother about "What address book yvReminder is looking in" - the information is the same and you may, as stated above, edit individual contacts through yvReminder! To access MS Outlook contacts using this "Method 2", you have to select in the menu "File"->"Select Address Book Type..."->"Windows Address Book - WAB". If yvReminder says, that "To run this application, you first must install v.2.0.50727 of the .Net Framework...", please do so: install "The Microsoft .NET Framework version 2.0 (x86) redistributable package" through the "Windows Update" site (http://www.windowsupdate.com/) or from "Microsoft Download Center". go to the "View->Filter Address Book Entries..." menu, clear "Only with events" checkbox and press "Ok" button. 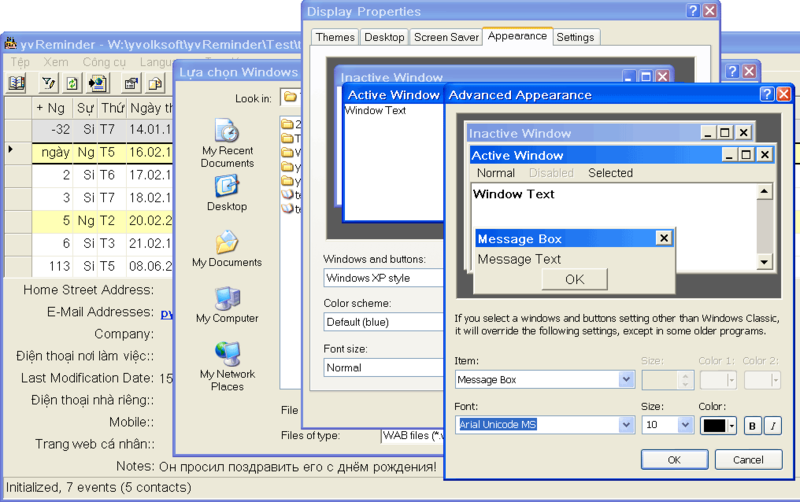 - font for the whole window contents is the same, as you set in Windows Control panel -> Display properties -> Appearance -> Advanced -> Item: "Message Box". To see _all_ languages of yvReminder correctly, I'm using "Arial Unicode MS" font - this font comes with MS Office. See the picture. - you may have custom font for the List of Events. Set it inside yvReminder: go to the menu Tools- > Options -> "List of Events font". In order to see international (unicode) characters in the properties of Contacts (both in the List of events and in the Additional Contact Info below the list), you have to turn on "Unicode" option of Address Book explicitely: in the Menu go to the Fle -> Open Address Book -> check "Unicode" option and press "Ok" button. This "Unicode" option doesn't work for some software configurations: for Windows 98 and for Windows Address Book (WAB), shared betweek MS Outlook Express and MS Outlook. All you have to do is to backup Windows Address Book from first computer and to restore it on another computer. This process is described in details in the Help-Center. -to the "Run" field of its "Task" tab. See How to use the Windows Task Scheduler for more details. - Try to think of Address Book as of Book Of Contacts (as I do) and not as a list of emails. Each contact (each person) in this book needs to have his (her) own record. It's naturally, because each record have only one field for name, not only for birthday and anniversary. There is no any problem, when more than one person (and so more than one record in the address book) have the same email. So when, for example, my friend and his wife have the same email, I create records for each of them with the same email. In the case they decide to have personal email for each of them (for any reason), I'll have to change email only. Looking at address book this way, there is also not a problem, when someone doesn't have any email. I don't count this record as a "fake email" but rather as a person, who can not be contacted by email (yet!). In a case he (or she) will get one, I'll have only to add the new email to the existing record. Of course, to organize your Address Book for convenient access you have to create "Folders" in the Address book and move records to that folders. For example, I have folders "Business", "Travel", "Programmers", "Rare", so I don't have to scroll the whole long list every time. Note, that if you didn't experiment with folders in Address Book before, you better make a backup of that Address Book before you start changes. The file of the Address Boook is usially called yourlogin.wab (yuri.wab in my case). If you have any comments, questions, wishes etc. about yvReminder, go to the yvReminder support forum. Using the forum, we'll try to make the program better, easier to use and... what do you want from it? To change language of the program's user interface, in the menu of yvReminder go to the "Language" and select your language from the list of available languages. If your language (language file) is not in the list of available languages yet, you may add new language file, using any existing language file from this list as a template for translation (or customization) of any program message or string. To add new language, at first, select language, that is most familiar to You, and then select "Language->Add new language file..." menu item to process with adding new language file. After this new language file will be created, you may see that your language's name appeared in the list of languages (that name is stored in the line 10002=... entry of the language file). Now you may start your translation, i.e. you may start editing existing language file (see below). To update translation of existing language, select that language and then select "Language->Edit language_name language file..." menu item to start editing (in Windows Notepad editor). Please note, that in order to see all characters of Your language correctly (with "umlauts" etc.) you have to save the language file in Unicode UTF-8 Encoding. After you've saved language file, select the same language in the "Language" menu to see the effect of your translation. If you've added new language file or updated existing one (or even this page with program description) into new language, please send them to me to be included in the next version of this program. So you will help people, speaking your language, to be comfortable with yvReminder. In order to find out, where is your language file located (so you can attach it to the message, being sending to me), select "Language->Open language file's folder" menu item. That folder will be opened with Windows Explorer (it's usially c:\Program Files\yvReminder\Language\). Freeware, i.e. at no cost. If you like this program, please consider donating. I was looking for a small, simple contact manager that reminded me of birthdays and anniversaries -- Windows Address book is super-small (odd for Microsoft, huh?) and your add-on gives it that extra functionality I needed. Great job. Very Big Thankx for your amazing and helpful programm! It's the best Birthday Reminder, ever seen! It would be great if you could keep on the good work with yvReminder! - I love this program! Small, easy, and pretty one. Added native MS Outlook support (successfully tested with MS Outlook 2007 and 2003): to access MS Outlook contacts, you have to select new "Address book type", called "MS Outlook Contacts". This version of yvReminder lets you select any contacts folder (not only Default contacts folder, as in case of WAB shared with MS Outlook). To edit contact's information, yvReminder opens the same Outlook "Contact" window, as in Outlook itself. New localization: Spanish (Spain). Many translations were updated. yvReminder supports many types of Address Books now! In fact, it supports any address book, that may be presented in XML format and may be accessed by URL (or by file name). You may customize yvReminder to support new type of Address Book, by adding (XSLT) decription of this Address Book (and description of its format) to the list of "Custom XML Address Books". See Custom XML Address Book. You (or one of your colleagues) may integrate yvReminder with your corporate "List of contacts" right now: all you have to do is to provide XML interface (URL to the page, generating XML on the fly from database) to yvReminder. (At work, I already enjoy seeing bithdays of all my colleaguesin a convenient way J). This version of yvReminder includes sample Address book of type "Sample - MSN Messenger's Contact List" - list of contacts, that is used by MSN Messenger today. The format of this file is exactly that of SOAP message, that is retrieved by MSN Messenger from global Internet storage. As soon as Microsoft will publish description of this interface, yvReminder will be changed to support it. The whole Address Book may be exported as XML file, so e.g. it may be seen by yvReminder later as Address Book Type of "Native XML Address Book of yvReminder". "Check for upgrades of yvReminder" function was added (in Menu->Help). New option added: move icon to system tray (notification area), when minimized. yvReminder is "Unicode program" now, so information from Address Book is shown in Unicode format (just like in "Address book" application itself). It doesn't matter, if you are using localized version of Windows or version, that has English user interface: you will see information about your contacts correctly as long as you configured Windows to use internationalized (unicode) fonts (in Windows Control panel -> Display properties -> Appearance -> Advanced)! You may change language of user interface without the need to change your Regional settings (in Windows Control panel -> Regional And Languages Options -> Advanced tab -> Language for non-Unicode programs). For example, you may see Vietnamese interface of yvReminder correctly even in Russian version of Windows XP. Columns of the "List of events" (in the grid) and additional information for selected contact (below the list of events) are customizable: you can choose from the long list of properties as much (or as few) propreties to be shown, as you wish. This list of properties includes almost every information, that is stored in Address book. You may even see such useful data, as "Last Modification Date" of contact's record, that is not shown in "Address book" application itself :-). yvReminder's code is reorganized, and now it's not as hanged on "Windows Address Book" (and Microsoft Outlook Express) as before. Support of other widespread address books is in my plans of future development of yvReminder. The program was moved to the Microsoft .NET v.1.1. Now you have to install "Microsoft .NET Framework Version 1.1" (if it's not installed already) from Windows Update site before installing yvReminder. New localizations: Czech, Romanian, Ukranian. Troubleshooting "January 1, 1601" - important information! In April 2003 Microsoft released new update (Cumulative Patch for Outlook Express (330994)), that has a bug, preventing yvReminder from showing dates of events. As a result, after installation of this patch you wouldn't see any events in versions of yvReminder before v.1.14. So please upgrade to the last version! As it appeared, the workaround, that was found against this bug, doesn't work for some software configurations (there are reports from Windows XP users). If all the days of events are "January 1, 1601", this means, that yvReminder tries to interpret "almost zero" as a valid date... so this means, that WAB API bug is "wider" for your sofware configuation... So maybe the only way for you is to uninstall that buggy OE update: it is called "Outlook Express Update Q330994" in "Control Panel -> Add/Remove Programs". Good news came for Windows XP users: we've got reports, that Windows XP Service Pack 2 (SP2) fixed the above mentioned bug: yvReminder works on Windows XP again! "WAB API Bug" problem was solved (unfortunately, it doesn't work for some software configurations). Thanks to Jim Beveridge , who pointed me to the workaround. List of events now contains contacts without any events (when "Only with events" check box is cleared in the "View->Edit Filter" menu). You may also change "No events background color" for such lines. Case insensitive sorting of strings (names, emails...). New localizations: Chinese Simplified, French, Serbian and Slovenian. New language of user interface: Spanish-Argentina. 3 new languages of user interface: German, Croatian and Italian. Export table with events to HTML file. 4 new columns in the list: E-mail; First, Middle and Last names. Width of program window is resizable - easy to fit all the columns in it. 2 new languages of user interface: Dutch and Polish.